Take your summer to the MAX with a can of Labatt Max Ice! 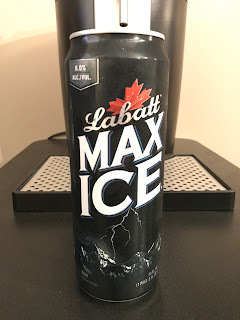 Labatt Max Ice is coming in at 8% ALC/VOL and is the "big brother" of last weeks feature, Labatt Ice. The can says BEER, but if you look online you will also see it classified as a malt liquor due to it's high alcohol/volume content. Either way you classify it, it's the next stop on our budget beer tour! Taste wise I would place it more in the malt liquor category rather than a beer, because the first sip is strong with a heavy aftertaste. People want to know if it's enjoyable? Yes it is! Remember to tune in to Bumming with Bobcat LIVE Monday nights at 10pm ET on sfdradio.com and join the party! Can't be there when we air live? You can always give it a listen in the archives! Cheers!